This lovely lower story duplex home was fully remodeled in May of 2011. Just 5 houses from the ocean with an ocean view patio area to fully enjoy the California lifestyle! Comfortable living room with high ceilings, beams and lots of light, plus a large flat screen TV and a queen sofa bed for extra sleeping room. The kitchen has hardwood cabinets, granite counter tops, stainless appliances and everything you need for cooking and eating at home on the dining table for four. The bedroom has a comfortable pillow top king size bed with a large flat screen TV and DVD player. There is 12K BTU LG Portable Air Conditioner in the living room, and a 10K BTU LG Portable Air Conditioner in the Bedroom. We provide two adult beach cruiser bicycles for exploring the miles and miles of boardwalk along the ocean and 4000 acre Mission Bay Park. Law St is at the beginning of the ocean boardwalk and Palisades Park was voted best beach overlook for watching the sunsets and the surfers. There is an outdoor shower, beach chairs, beach towels, umbrella and sand toys. 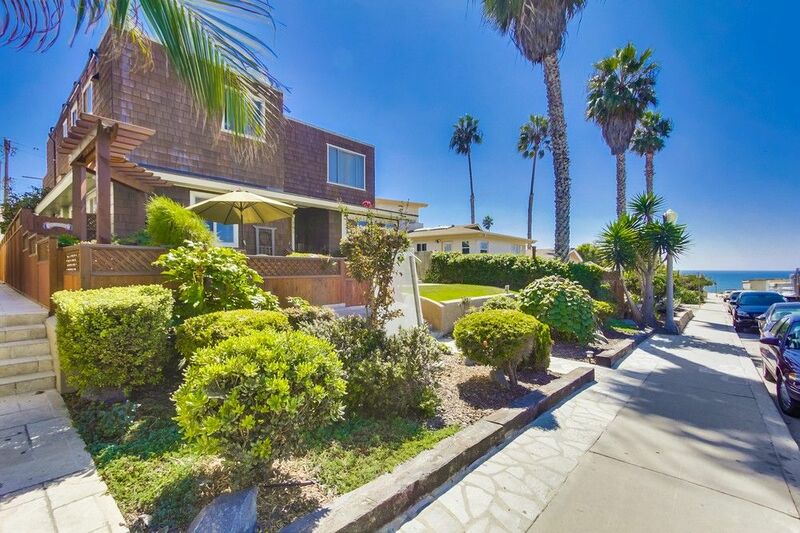 This new rental is truly a quiet oasis at the beach, yet you are just 6 blocks from Crystal Pier and the myriad of seafood, steak and ethnic restaurants that Pacific Beach has to offer. You are only two miles from SeaWorld, 4 miles from Old Town, 8 miles from The airport and the downtown GasLamp area, the famous San Diego Zoo and the Embarcadero with it's floating museums. LegoLand, the Wild Animal Park, Disneyland, the historical gold mining town of Julian and Anza Borrego Desert State Park are all within easy driving distance. Come and enjoy all that San Diego has to offer including the best weather in the nation! From patio and living room. The patio is perfect for afternoon barbecuing. The Bdrm TV is a 43 in., 4K Samsung Smart TV. The LvRm TV is a 55 in., 4k Samsung Smart TV. Both TVs are served by Time Warner Cable and provide over 200 channels. We thoroughly enjoyed our stay in PB! The apartment was clean, perfectly located and Nancy and Jim were very helpful with their suggestions of restaurants, things to do, etc. We were so happy with our stay and cannot wait to return! One block to the beach, oceanfront walkways to get to restaurants and shops, Perfect location. The house is very comfortable, kitchen equipped with about anything you'll need. We really enjoyed our stay and would stay here again. This was an awesome little house. Just perfect for three. The property was very clean and nice. It was close to the beach. We enjoyed the front porch and view of the ocean. We would stay again. Beautiful remodel a block from the sand. Crystal pier and tons of restaurants a few blocks away. Everything you need - 5 beach chairs, rolling cooler and blue ice, 2 new cruiser bikes, boogie boards and surf boards, sand toys, BBQ and patio, private parking spot, fully equipped kitchen, big TV and comprehensive write-up on the unit and neighborhood. Located on the quiet side of PB. My wife and I just spent a week here and I am recommending it to my daughter and her family (husband and 2 and 4 year old sons). The property was exactly as described. Meticulously maintained, bed as comfortable as home, great pullout couch for our third person, fully equipped kitchen ( although we didn’t eat there much) and walking distance to ocean and boardwalk. The weather was not typical of San Diego so did not avail ourselves to the bikes and surf boards, but still enjoyed the outdoors walking along the beach, hiking at Torrey Pines, driving to the San Diego zoo safari and up to Burbank’s for a tour of Warner Bros Studios. Drove up to Temecula to a Winery with spectacular view. Favorite breakfast place..The Fig Tree, Woodys and Better Buzzed to name a few. The Athena restaurant near Vons was an amazing find...truly some of the best Greek food we’ve ever had . Javier’s Mexican food (Santa Monica) was awesome also. Checked a few things off our bucket list while visiting our relatives who live in PB. Would definitely stay here again! Parking on street as well as a spot reserved behind the building! Nice quiet neighborhood. Due to HomeAway's limited ability to post additional fees, certain fees are not included in the quote/rate and may be required: -Additional $25 for Summer Cleanings. -Additional $50 cleaning fee for stays 2 weeks and more. -Baby equipment (if available): Fees vary based on equipment needed. -Portable Air Conditioning Rental (if available): $50 delivery, $25/day (3 day min). Nancy's Vacation Rentals is not responsible for any erroneous descriptions or rates posted on this website or any other 3rd party travel website. Rates are subject to change until reservation is confirmed by Nancy’s Vacation Rentals​. For up-to-date availability and accurate pricing, please visit NancysVacationRentals. You must read and accept our Terms and Agreement and House Rules prior to us approving your reservation request. Contact us for last minute deals or for monthly rentals.